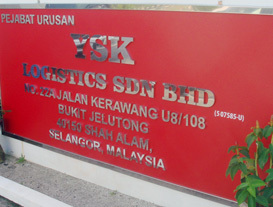 YSK LOGISTICS SDN BHD was founded in 1999. Originally located in Glenmarie’s Temasya Industrial Park, it subsequently relocated to a bigger and more equipped warehouse (1.5 acre) at Taman Perindustrian Bukit Jelutong. A company eventuated from a vision and silver of blessings, has grown from a strength of five employees to over thirty dedicated staffs under its employment today. As at 2011, the company owns 10 fleet of trucks, 4 forklifts a fully equipped and highly secured warehouse and a separate forwarding division based in Bandar Bukit Tinggi, Klang. Copywright © 2011 YSK Logistics Sdn Bhd. All Rights Reserved.